While strolling in the Norwegian countryside with the writer Tomas Espedal, Marco Godinho discovered by chance the entrance to a disused tunnel. 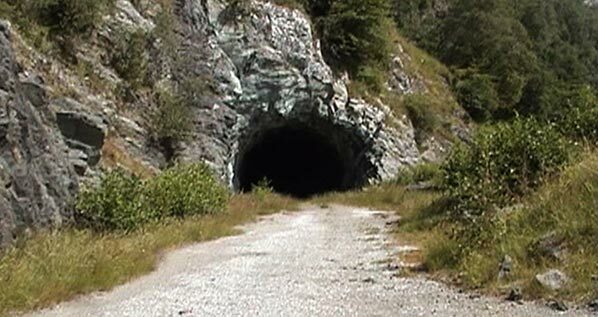 Something White (2008) is the videographic account of the two men’s crossing of this long underground path of stone, where darkness reigned supreme. However, the work is as much about their emotional journey through boldness, confidence, loss of reference points, fear, dependence, and liberating humour. The superimposition of physical and psychological pathways is characteristic of Godinho’s interest in the transfer of our physical and subjective experience of space and time into a mental cartography that is constantly being reformulated. Born in 1978 in Salvaterra de Magos in Portugal, Marco Godinho shares his life between Paris and Luxembourg. In a conceptualist spirit, he is interested in subjective perception of time and space through exploration of the notions of wandering, exile, experience, and time as it is lived. Since 2006, he has had fifteen solo exhibitions, including at the Instituto de Camões in Luxembourg (2008, 2011), the Centre d’arts plastiques et visuels de la Ville de Lille, France (2009), and the Art Attitude Hervé Bize Gallery in Nancy (2007, 2009), which represents him. His works have been in many group exhibitions, including Out-Of-Sync. The Paradoxes of Time at MUDAM – Musée d’Art Moderne Grand-Duc Jean in Luxembourg (2011), Mappamundi at the Fondation Berardo in Lisbon (2011), Marcher-Créer at the Rencontres d’Arles (2010), and Transplant Goes Landmark at the Kunsthall in Bergen, Norway (2008). In 2006, Godinho was the winner of the Jury Prize at the 22nd Esch Biennale in Luxembourg.